International gin expert, David T. Smith has written four books on gin, is the author of the gin blog Summer Fruit Cup, contributed numerous articles on gin history, production and cocktails. In addition, Smith has taught numerous gin classes and seminars and consulted for several brands. 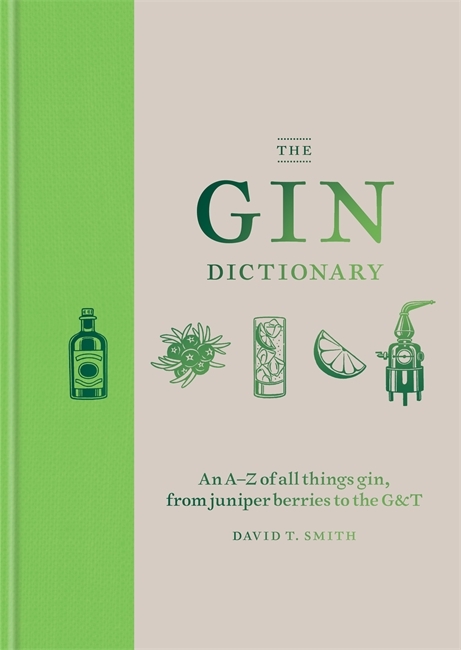 The Gin Dictionary: An A-Z of all things gin, from juniper berries to the G&T is Smith’s fifth book and an encapsulation of his deep passion and knowledge of all things gin. As the title suggests, the book is a dictionary about gin, organized alphabetically and covering botanicals, gin brands, chemical compounds found in gin, cocktails, cocktail ingredients, flavor profiles, gin styles, history, production, as well as mixology terms and practices. The book is very thorough in its scope physically it is very lovely with a well textured hard cover and simple illustrations that supports the the content of the book. Physical appearance aside, The Gin Dictionary is a fantastic reference book for complete beginners and for experts. For gin distillers, The Gin Dictionary can be both an excellent reference book and a potential item to sell to your guests in tasting rooms. The book contains about 200 entries which in the distillery can be a good source of inspiration to experiment with different production techniques or potential botanicals to add to a gin recipe. In the tasting room, The Gin Dictionary can be an excellent tool to educate your staff and your customers. Craft distillers have endless stories about how their gin has converted once gun shy customers to gin drinkers. Offering The Gin Dictionary at retail can continue their gin education once they leave which benefits everyone, because and educated gin drinker is likely to return to premium and craft gins for their next purchase. Since 1992, Anistatia Miller and Jared Brown have been writing, speaking and teaching about the history of cocktails and spirits. Together they have written more than a dozen books on Champagne, vermouth, cocktails, and spirits as well as articles for Imbibe, Wine Spectator, and the Financial Times. In 2009, Brown became the head distiller at Sipsmith in London and he has helped to develop spirits in Sweden, Norway, Vietnam and the US. 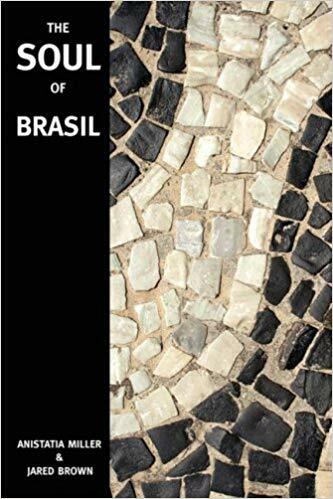 In 2008, Miller and Brown wrote The Soul of Brasil, which is a short history of distillation, of Brazil, and the important cultural role cachaça plays in that country. While the book seems to have been sponsored by the cachaça distillery Sagatiba, it is very well written, and serves as a good introduction to the world's ninth largest spirits category. The book is broken down into two parts; part one traces the history of beverage alcohol since 7000 BC, European conquest of the New World, the creation of cachaça, its decline in popularity and its resurgence. In part two, Miller and Brown describe what makes cachaça unique, how it is made, its categories and flavors, as well as popular food and drink combinations. Despite the fact that Brazil only exports about 1% of the 1.5 billion liters of cachaça sold each year, the story of cachaça is interesting for other small distillers. Though approximately one-third of the cachaça market is controlled by one brand, more than 30,000 cachaça distillers exist in Brazil. These local micro-distillers are able to remain relevant by fully embracing the local music, dance, food, and drinks of their region. By becoming enmeshed in the community, their community has a reason to buy their spirit over the national brands. Hubert Germain-Robin comes from a long line of Cognac producers in France. But after years of training in traditional methods of distillation and maturation he moved to California to explore new possibilities. Free of the strict laws and traditions of Cognac, Germain-Robin was able to experiment and take chances in some areas while keeping the most effective traditional methods of making brandy. What resulted were some of the finest American brandies ever produced. Germain-Robin’s newest book The Maturation of Distilled Spirits: Vision & Patience, is the follow up to Traditional Distillation: Art & Passion. In the new book Germain-Robin walks the reader through the entirety of the maturation process, from the oak that goes into the barrels, cellaring, proofing, blending and bottling the finished spirit all focused on the central theme of vision and patience. However, at 146 pages this book is more akin to a seminar than years of apprenticeship. To fully capture the wealth of knowledge that Germain-Robin learned over his lifetime of work would probably be near impossible, but the purpose of the book is to invite the reader into thinking about the active role the cellar master takes in guiding the maturation of the spirit as it sits in barrels for years or even decades. The Maturation of Distilled Spirits is a good place to start for any distiller who wants to explore and employ traditional methods of maturation. Each chapter offers a brief explanation of a variety of maturation techniques, some of which are common in Cognac but completely novel for American whiskey. Following the theme of vision and patience, Germain-Robin explains the important role of the cellar master and how their choices and decisions serve both themselves and future generations. While creating a spirit that can age for 70-plus years is an obvious skill, so too is the patience and ability to know when to allow barrels to keep aging, when to transfer them to glass demijohns, and when to blend and bottle these older spirits. Germain-Robin is a proponent of what some are calling “Slow Distillation,” a movement that looks to encourage the production of great spirits made from high quality ingredients with traditional techniques. U.S. craft distillers can learn much from masters like Germain-Robin and develop new traditions that will allow future generations to reap the benefits of their vision and patience. Fred Minnick is the author of five books, three of which are about whiskey and the history of bourbon. His book Whiskey Women earned a Gold Medal at the ForeWord Reviews Book Awards and a Silver at the Indie Publisher Awards. Minnick serves as a judge for the San Francisco World Spirits Competition and the World Whiskies Awards. Minnick is also an Iraq War veteran where he served as a U.S. Army public affairs photojournalist. Minnick’s newest book, Bourbon: The Rise, Fall, and Rebirth of an American Whiskey is a thorough history of bourbon, which for over 200 years has been one of the nation’s most important spirits. The book is broken down into 12 chapters that chart, as the subtitle says, the rise, fall and rebirth of an American whiskey. Minnick quickly jumps into contested waters by exploring who has the most legitimate claim to be called the “Father of Bourbon.” Unlike many other whiskey books that just repeat marketing myths, Minnick has done the work of diving into the historical record and offers a better picture of the history of bourbon than has been seen in some time. He traces the large social movements as well as the lives of individuals that supported and fought the bourbon industry throughout U.S. history. In an attempt to appeal to more readers, the pages are illustrated, and Minnick uses quite a few sidebars in each chapter to give quick details or extrapolate on an interesting moment or person in bourbon history. Bourbon is one of the best histories on the subject to come along in a while. Colin Spoelman and David Haskell are cofounders of Kings County Distillery and co-authors of now two books. Spoelman, the head distiller of Kings County Distillery, grew up in the dry Harlan County of eastern Kentucky and only began experimenting with distilling after moving to New York. When Spoelman met Haskell, an editor of New York magazine and the great-grandson of a former New York bootlegger, the idea for Kings County Distillery was born. Since 2010, Kings County Distillery has won a number of medals for its spirits, and most recently it was named 2016 Distillery of the Year by ADI. An employee of Brooklyn’s Green-Wood Cemetery inspired Spoelman and Haskell to write their newest book after organizing a tour of the graves of distillers interred there. As they looked at cemeteries around the country, they realized that the buried distillers all had intriguing stories to tell that were uniquely American. The book retells shortened biographies of 76 distillers who ranged the gamut from slaves and outlaws to successful businessmen and U.S. presidents. The stories are arranged by the distillers’ death dates, and are interspersed with newspaper clippings of distillery accidents that have lamentably taken the lives of workers, neighbors and rescue personnel for the past 400 years. Dead Distillers is an excellent book that pays tribute to and humanizes those whose stories are included. For the average consumer, spirits named after dead distillers are seen as marketing depicting them as whiskey gods in an American pantheon. However, Dead Distillers succeeds at honoring real people who led fascinating and complicated lives with their biographies and two fantastic infographics. While most infographics try to simplify data to the point that it is immediately digestible in a single glance, the two included in the book are more akin to topographical maps that only reveal the depth of their content through close inspection. And finally, while Spoelman and Haskell wrote the book for anyone interested in distilling, it offers living distillers a memorial as real as any graveyard headstone that they can visit and remember both the successes and failures of those who came before them.